A RALLY FOR ANARCHY IN ARTS EDUCATION!!! SATURDAY!!! A 5-week, 11-city, coast-to-coast road trip that crosses state lines and institutional boundaries to inspire and enable local art students to define the future of their own educational experience. Traveling the byways of America in a limousine painted as a school bus, BHQF brings together concerned educators, artists, arts administrators, and—most importantly—students to BRAINSTORM THE FUTURE OF ART SCHOOLS. ***How should they be organized? ***If not for careers, what is the essence of art itself? These fundamental questions have long haunted artists, and the BHQF are interested in putting the questions back in the hands of students across America through a combination of dynamic public rallies and intimate conversations. 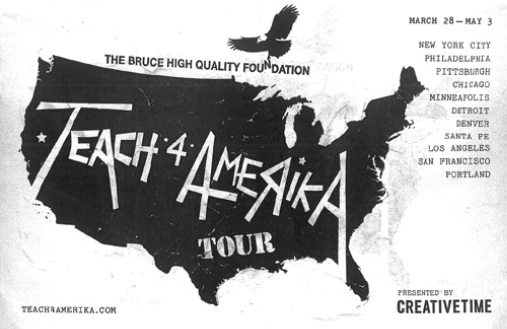 “Teach 4 Amerika aims to empower artists to create the education they need and not beholden them to a system that professionalizes them out of their own specificity,” said the BRUCE HIGH QUALITY FOUNDATION. “The Teach 4 Amerika tour will highlight the contradictions and crisis operating at the center of art education in the United States today,” said NATO THOMPOSON, Chief Curator, CREATIVE TIME. Teach 4 Amerika is presented in partnership with 1419, Carnegie Mellon School of Art, College for Creative Studies, The Cooper Union for the Advancement of Science and Art, Detroit SOUP, Experimental Community Education for the Twin Cities (EXCO), Feldman Gallery at PNCA, Gallery 400 at the University of Illinois at Chicago, Illiterate Magazine, Los Angeles Country Museum of Art, LAXART, Museum of Contemporary Art Denver, Museum of Contemporary Art Detroit, Pacific Northwest College of Art, Portland State University Art and Social Practice MFA, Roots & Culture, San Francisco Art Institute, The Soap Factory, Southern Exposure, threewalls, Tyler School of Art at Temple University, University of Minnesota, Vox Populi, The Waffle Shop, Walker Art Center, The Andy Warhol Museum, and Win Wear. *As long as 1419 has existed[i], it’s been several things simultaneously. 1419 was (and is) a flexible collective of artists; it was an organization that facilitated work and the exhibition of that work by emerging artists in the Twin Cities; it was a long-term experiment in how to be an artist; it was an attempt to get over having gone to school for art; it was an examination of institution. The small group of people who lead 1419 since May 2010[ii] had a range of opinions about which of these identities took precedence at what time, and how best to make decisions to serve these identities. Around December 2010, the five artists who made up the board of 1419 (Broc Blegen, Nicholas Marcouiller, Billy Mullaney, Brent Grihalva, and Ben Gansky [who all love each other, really]) had reached a point where their differences in opinion combined with a desire to focus on their own work made it seem silly to keep operating as a unit. Brent, Billy, and Nick stepped down from the board, and Ben and Broc felt both optimistic and confused about how to carry on without them. We [Ben and Broc] wondered if indeed we should. In the past few weeks, we have realized that while we resolutely believe in the mission of creating opportunities and facilitating the work of emerging artists, we no longer feel that we can be the ones to be responsible for the organization that does this, right now. We would dearly love to see another organization arise to do so, but our individual focuses have to be on our own work right now. The part of 1419 that always felt like it had the most integrity was the dialogue created and furthered by the core group of artists, and with Nic’s departure for Elsewhere Collaborative in North Carolina, a majority of us graduating from school and pursuing independent ventures, and the compromises necessitated in attempting to retain control of our building, we feel that our strongest move is to end it. However, as mentioned above, 1419 was always much more than a facilitating/hosting organization. While that may have been the most visible part of 1419, 1419 was also a name for a group of artists, many of whom exhibited, performed, and/or developed work at 1419 continuously over the last 18 months. This core group influenced each others’ work and will (we hope) continue to do so. In this aspect, 1419 lives. 1419 provided a small group of people with the opportunity to experiment with a project the size and shape of a small independent arts institution. As a group of people with a shared mistrust of institutions/art-corporations, we concentrated on remaining continually self-reflexive and responsive to our own and others’ criticism. We asked ourselves, ‘who are we to decide what art gets to happen?’ and so we did our best to accept every proposal at 1419, even and especially the proposals for art we knew we wouldn’t like. We asked ourselves ‘who are we to make decisions that affect this whole group of people?’ so we experimented with ways to make ourselves more transparent, to open up the decision-making process, and to share responsibilities. Most of these experiments failed. These experiments were awesome! The people involved learned a ton! We all had different opinions about what to do and what had happened, and we argued and drank beer and smoked weed and stayed up late creating diagrams on whiteboards[iv]. The experience was deeply influential for each person involved at that level. These past 18 months doing this thing we’ve called 1419 have been amazing. We’ve had the opportunity to produce the work of more than 150 emerging artists over 60+ events. We’ve hosted workshops, lectures, discussions, potlucks, performances, concerts, exhibitions, soccer tournaments, readings, installations, and rehearsals, with a focus on interdisciplinary, experimental, collaboratively-developed and interactive work. We also want to make it known that 1419’s end has been in the works for a while. Since roughly January we’ve known that we wanted to end 1419. Since then, we’ve done our best to do right by the artists whose work was slotted for presentation/development in the space. Over the last few months, the artists of 1419 have lost more and more control of the use of the building as our landlord asserted himself by renting the building out for parties and events. Just so everyone is clear, 1419 is not responsible for these events. We will no longer be producing work in the storefront space on Washington Ave.
We want to thank the original group of students who began 1419. We want to thank the hundreds of artists who have shown and/or created work in our space and the thousands of people who came to events. We want to thank our gracious mentors for getting it. We want to thank Surinder Singh, our landlord, for trusting a group of 20 year old students to make their dreams a reality in his building. He is probably the only landlord in the city that would have allowed us to do what we did. This building will forever be in our hearts. And we want to thank each other, for not waiting for permission. [ii] Sometime in the spring of 2010, the executive board was founded and composed of Nicholas Marcouiller, Broc Blegen, Brent Grihalva, and Billy Mullaney. Ben Gansky joined the board in July 2010. Later on, Eddie Burns joined as an ever-tolerant business advisor (Alex Heide too), and Jeff Shockley joined for a hot second. Prior to an official executive board 1419 was brought into existence and managed by a collective of wonderful people including those listed above and also Kalen Keir, Arij Mikati, Ben Yela, Ryan Murphy, Evy Muench, Adam Loomis, Nicola Carpenter, Ross Orenstein, David Steinman, and others. [iii] Ben argues for this metaphor, but it’s up for debate (like all of this). [iv] The whiteboards were actually mostly Billy and sometimes Ben. This is not a day of sadness. erased bobrauschenbergamerica is the third piece in 1419's Theatre Performance Season. Check out the e-bra page here. Feb 11-20, Fri-Sun @ 8pm. To reserve tickets, email erasedbobrauschenbergamerica@gmail.com. 2nd ANNUAL 1419 Xmas show "Daddy likes a Joe Moore Christmas"
THE SECOND ANNUAL XMAS SHOW AT 1419! THERE WILL BE JOE MOORE! After a small glitch last month, we are officially debuting the Room Zero series at 1419 this Friday at 8pm. Not only is it our first show in 1419, it is also the long-anticipated CD release show for PATCH, the brainchild of Peter Kenyon and the best unknown rock band in the Twin Cities. If you don't know already, the album "Schematics" was produced, mixed and mastered by yours truly and Petey K for over a year. We ...spent hours upon hours trying to get things just right. I'm very proud of my work, needless to say, and the entire album is completely mind-blowing. That much I can promise. This is a bit of an "all in the family" show, with Shield Your Eyes opening. The show is FREE, doors open at 8pm. See flier attached. Swing by for an immersive and inspiring evening of UNDERWATER PUPPETRY, MUSIC, AND REVELRY! WATERBOX is a new exploration in toy theatre. 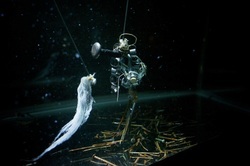 This intimate underwater puppet show focuses on light and gesture using abstract shapes and imagery. Please join us for our first showing of this visually striking and innovative work, already chosen to be part of Open Eye Figure Theater's nationally renowned Toy Theatre After Dark festival. We are asking a $5-10 sliding scale donation. However, no one will be turned away for lack of funds. HOTPANTS SATURDAY NIGHT AFTER WATERBOX!!!!! Now that winter is on it's way it makes for a sweaty dancefloor. We will have the same cast of goons Brian Engel, Ben Mena,Dale Burback, RAMBO, and many very special guests. We will be using 2 floors for this event!!! Come support Rare Funk and Soul this side of the river!! RECORDS ONLY!! NO DIGITAL NEVER EVER!!!! CAN-SEAL N CARRY in affect (shhh). $5 !! We go Late!!! Works Progress/West Bank Social Center welcomes Stephanie Sherman, co-founder and collaborative director of Elsewhere, for a talk and informal Q+A session on the living museum, site-specific residency program, and creative laboratory. Set within a former thrift store in downtown Greensboro, NC, Elsewhere started from a massive collection of 58-years worth of cultural surplus sitting without destination, and in 2003 was converted into a living museum, conceptual+material playground, and space for investigating everyday and extraordinary life. Now, nothing is for sale, and artists live and work amidst an endlessly circulating collection of objects and artworks that is continually re-purposed and re-imagined. Elsewhere is a unique residency model, hosting over 40 creatives from across the globe each year who create projects with and within this evolving environment, responding to the things, architectures, collaborative community, and developing downtown Greensboro. Stephanie will share the story of Elsewhere's history, evolution, contemporary challenges, and future visions. She will speak from the interwoven perspectives of non-profit director, artist, curator, writer, and organizer, insisting that these practices together can make for a more dynamic, responsive, sustainable (art)world. Stephanie explores the intersection of everyday and extraordinary life through site-specific projects that interweave the practices of curator, artist, writer, and organizer. She is currently collaborative director and founder of Elsewhere, a living museum and residency program set within a three-story former thrift store. Her creative and critical research themes include magic realism, cultural outpourings, public processes, urban revitalization, smiling and laughter, social formations, collective imaginaries, and how things compose narratives and designate patterns. She loves people, books, and buildings, in theory and practice, and schooling in 20th C English Literature at UPenn and Critical Theory and Philosophy at Duke inform her current projects. Praxis is a free monthly artist talk coordinated by Works Progress at West Bank Social Center. Local, national, and international artists, curators, administrators and cultural producers discuss their work in an intimate setting, followed (when possible) by practical exercises and activities for those interested in experimenting with new ways of thinking, making and doing. It's been a while since the last show, and I suppose it's about time I filled everyone in on what's been going on. Room Zero as we knew it is no more. To put it simply, Mike and I had some differences of opinion with management there, and we had to start looking elsewhere for a place if we wanted to continue the concert series we started. Fortunately, our friends at 1419 were exceedingly positive when I pitched the ide...a of a Room Zero merge. We are all looking forward to this move, and I personally think that 1419 is, in some ways, the perfect venue for "Room Zero" shows, especially considering the fact that our audience-base has been quickly outgrowing the old space. Let me assure you that the only thing changing is our location. Our name will remain the same (even though there technically isn't a room "0" in 1419--use your imagination) and we will keep bringing you amazing shows featuring artists and bands from the Twin Cities and beyond that are doing great things under the radar. II. Pigswill - An electronic sound artist who aims to resurrect the old-school industrial attitude. The show is this Saturday, November 13, 8pm in 1419 ( http://1419art.weebly.com/index.html ) and is FREE. See flier attached. A night where friends embrace.dream. and dance.